You provide certain personally identifiable information (such as your name and email address) to ServiceDogKits.com when creating an account or choosing to participate in various activities on the Website, such as uploading, storing or publishing photos, images, or other content, entering contests or sweepstakes, participating in promotions, responding to surveys, or subscribing to newsletters or other mailing lists. ServiceDogKits.com receives your personally identifiable information when you use ServiceDogKits.com software applications that are available on third party websites and you are invited to register and create a personal account with such third party websites in order to save any items created using the ServiceDogKits.com software applications available on such website. 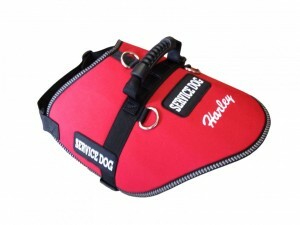 ServiceDogKits.com collects and stores information required to conduct business transactions requested by our customers (such as the purchase of any items for sale on the Website) and to properly conduct communications with our customers. Such information may include personally identifiable information. Personally identifiable information is information that tells us specifics about you, such as your name, address, IP address, e-mail address, phone number, credit card number, bank account number and other similar information. Except as provided below, ServiceDogKits.com will not divulge personally identifiable information about you to any third party, unless you give us express consent to do so. ServiceDogKits.com may share non-identifying aggregated demographic information with our affiliates, partners and advertisers. If you submit personally identifiable information to us through the Website, then we use this information to operate, maintain, and provide to you the features and functionality of the Website. Any personally identifiable information including, without limitation, any text, image, photo, drawing, video or other content that you voluntarily save and publish online (each a “User Submission“) on the Website becomes publicly available and can be collected and used by others. Any User Submissions that you submit to the Website may be redistributed through the internet and other media channels, and may be viewed by the general public. We may use your email address or other personally identifiable information to send commercial or marketing messages. We may use your email address for non-marketing or administrative purposes (such as notifying you of major Website changes or for customer service purposes). We use both your personally identifiable information and certain non-personally-identifiable information (such as anonymous User usage data, cookies, IP addresses, browser type, clickstream data, etc.) to improve the quality and design of the Website and to create new features, promotions, functionality, and services by storing, tracking, and analyzing User preferences and trends. 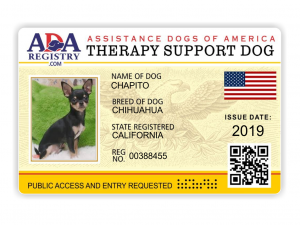 If you are using this Website to purchase any goods or services, ServiceDogKits.com may need for you to provide us with certain financial information so that ServiceDogKits.com may effect the payment transaction. 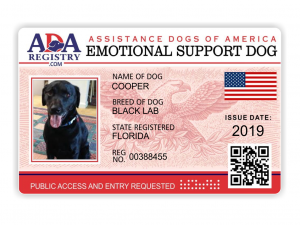 As part of our payment system, ServiceDogKits.com or third parties performing sales processing services on our behalf, will collect, store and use non-public personally identifiable information, such as your name, address, credit card number, bank routing number and bank account number, your account number with us and your e-mail address. In addition, the payment system will also collect information regarding the actual bill payment transaction, including the date and amount paid. ServiceDogKits.com will store and protect this information in the same manner that ServiceDogKits.com stores and protects other personal information. 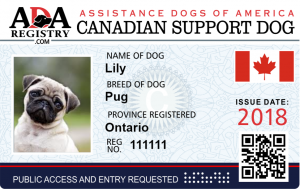 If you begin but fail to complete the registration or purchase process for Free My Paws, we may contact you in an effort to help you use Free My Paws or send you other emails with details about Free My Paws or other services that may be of interest. You can opt-out of receiving these emails by clicking on the opt-out link included in the email you receive. You hereby grant FMP and its representatives the right to access your account and records as necessary to investigate any use of the Website or Services including, but not limited to, copyright infringement, abuse, and/or harassment. Any personally identifiable information that ServiceDogKits.com may collect about you is saved in a profile that is kept on our server. 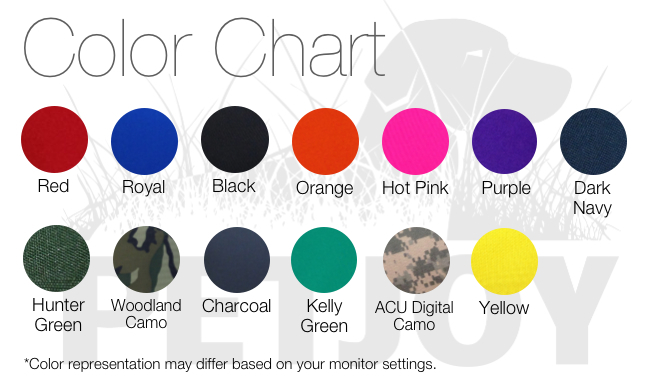 The profile includes your contact information and billing information where applicable. You can help us maintain the accuracy of your profile by updating the information in your profile when you change your address, phone number or e-mail address. If you wish to update your contact or billing information, you can do so when you log in to our customer section. Otherwise, you can let us know of any changes to your information by contacting us Please include your current contact information so that ServiceDogKits.com can make the appropriate corrections. FMP does not provide any personally identifiable information to these third-party ad servers or ad networks without your consent. 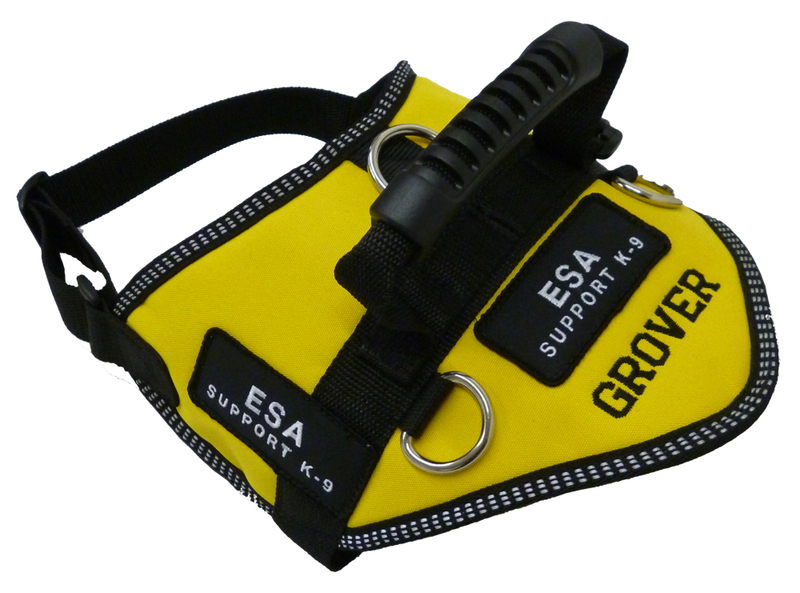 However, please note that if an advertiser asks ServiceDogKits.com to show an advertisement to a certain audience (for example, women ages 18-34) or audience segment (for example, women ages 18-24 who have viewed certain channels of content) and you respond to that advertisement, the advertiser or ad-server may conclude that you fit the description of the audience they are trying to reach. The advertiser may also use information regarding your use of the Website, such as the number of times you viewed an ad (but not any personally identifiable information), to determine which ads to deliver to you. 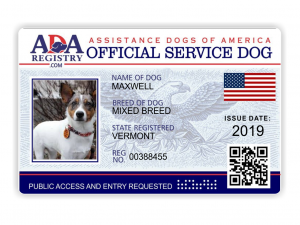 ServiceDogKits.com will use commercially reasonable physical, electronic and procedural safeguards to protect the security, integrity and privacy of information under our control. These security measures include IP address validation, SSL (secure socket layer) encryption and password protection. Although ServiceDogKits.com will exercise reasonable care in providing secure transmission of information between your computer and our servers, due to the inherent insecurity of the internet, ServiceDogKits.com cannot ensure or warrant the security, integrity or privacy of any information or data transmitted to us over the Internet and ServiceDogKits.com accepts no liability for any breach of security or any unintentional disclosure, loss or misuse of any such information or data or for the actions of any third parties that may obtain any such information or data. If ServiceDogKits.com learns of a security systems breach, then we may attempt to notify you electronically so that you can take appropriate protective steps. 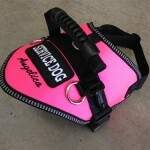 ServiceDogKits.com may post a notice on the Website if a security breach occurs. Depending on where you live, you may have a legal right to receive notice of a security breach in writing. Protecting the privacy of children is especially important to ServiceDogKits.com. For that reason, ServiceDogKits.com does not knowingly collect or maintain personally identifiable information or non-personally-identifiable information on the Website from persons under 13 years of age without parental consent. If ServiceDogKits.com learns that personally identifiable information of persons under 13 years of age has been collected on the Website without verified parental consent, then ServiceDogKits.com will take the appropriate steps to delete this information. If a minor under the age of 13 attempts to register for the Website, the Website will instruct such minor to obtain parental consent for registration. The Website will instruct any such minor to provide a parent’s email address for parental permission, verification and confirmation of the minor’s attempt to create and account. A subsequent email will be sent from ServiceDogKits.com to the parent seeking verifiable confirmation that the parent consents to their child’s use of the Website and creation of an account, and identifying the types of information that ServiceDogKits.com collects about users under the age of 13. Only upon ServiceDogKits.com receipt of an email from a parent indicating that such parent has provided permission for his or her child under the age of 13 to register for the Website and create and account, will such child under the age of 13 be able to register and create an account in connection with the Website. ServiceDogKits.com collects the first and last name, email address, IP address, age, parent’s email address and county of residence from Users under the age of 13. ServiceDogKits.com uses this information to develop mechanisms to enhance an end-user’s experience and to tailor advertisements for goods and services. ServiceDogKits.com does not share the personal information of minors under the age of 13 with third parties. However, to the extent that certain third party links available on the Website require individuals accessing such sites to register for such sites, Users under the age of 13 will need to separately register with such third party sites and may not be able to access the services available on such sites without registration. In the event that ServiceDogKits.com is acquired by or merged with a third party entity, we reserve the right, in any of these circumstances, to transfer or assign the information we have collected from our Users as part of such merger, acquisition, sale, or other change of control. 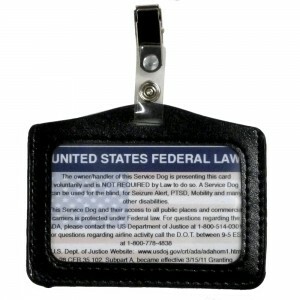 In the unlikely event of ServiceDogKits.com bankruptcy, insolvency, reorganization, receivership, or assignment for the benefit of creditors, or the application of laws or equitable principles affecting creditors’ rights generally, we may not be able to control how your personal information is treated, transferred, or used. You also agree that, in the event any dispute or claim arises out of or relating to your use of the Website, you and FMP will attempt in good faith to negotiate a written resolution of the matter. You agree that if the matter remains unresolved for forty-five (45) days after notification (via certified mail or personal delivery) that a dispute exists, you and FMP shall join in mediation services in Arizona with a mutually agreed upon mediator in an attempt to resolve the dispute. Should you file any arbitration claims, or any administrative or legal actions without first having attempted to resolve the matter by mediation, then you agree that you will not be entitled to recover attorneys’ fees, even if you would otherwise be entitled to them.